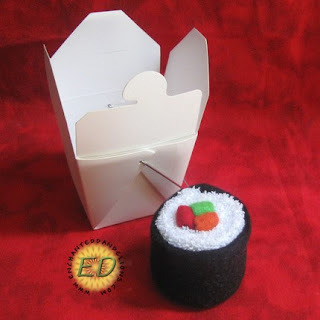 EnchantedDandelions makes handcrafted items for babies and children, but I have another use for her adorable terry cloth sushi roll: party favours! Girls night gifts, bridal party gifts, or baby shower favours, these little babies do double duty as invaluable wash cloths as well as cute decor for your guests' bathroom, powder room or diaper bag. Wouldn't this look so sweet all packaged up at each place setting with your guests' names printed on the take-out container?